Cheerson CX10A has new another board. A couple of days ago I bought CX10A and I tried to bind it using IR8M. I have tried CX10 -> Green and Blue also. However I couldn't bind it. So I have torn down CX10A and Transmitter. Can you please take a look pictures below? Is it possible to bind this CX10A using IR8M? If possible, what protocol should I set? 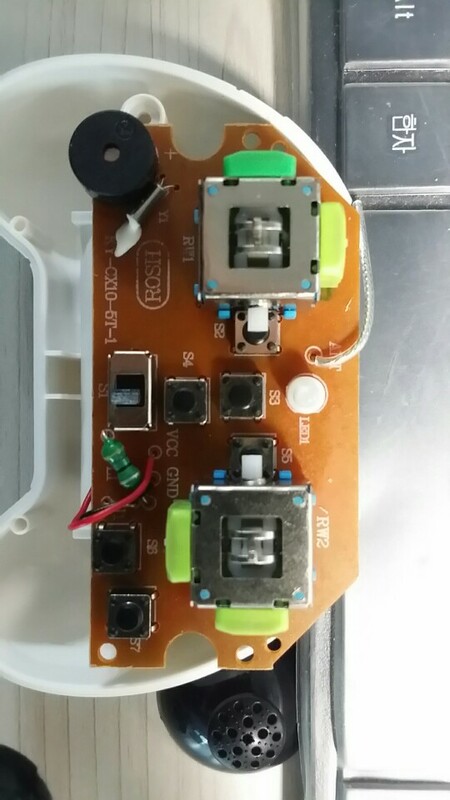 Replied by song1116 on topic Cheerson CX10A has new another board. Today I have set all of the Q303 options but failed. Replied by goebish on topic Cheerson CX10A has new another board. 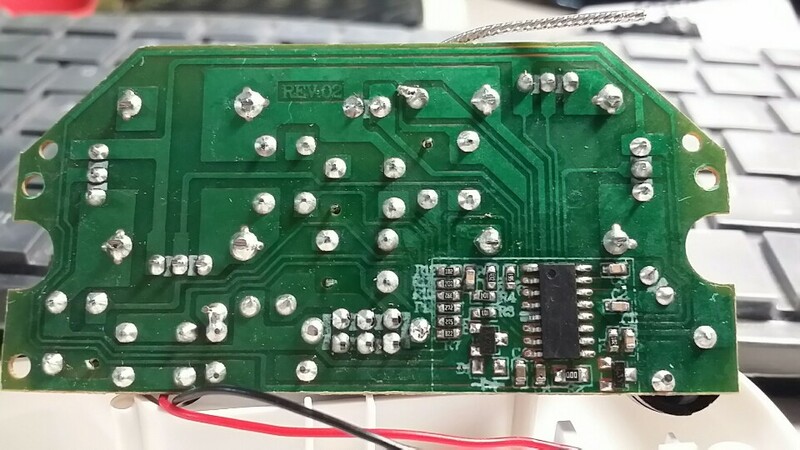 I think it's using a XNS1042 MCU with builtin xn297l transceiver (SOIC-16, antenna connected to IC pin #1 in the transmitter), there's a chance it can be reverse engineered and added to Deviation but it can't be done with a logic analyzer, someone would have to send one to a developer for analysis. Last edit: 27 Feb 2019 10:41 by goebish. 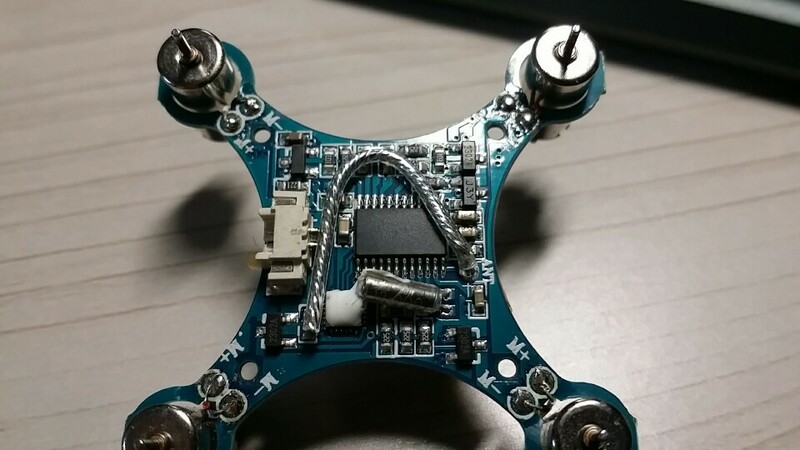 To verify if the recent CX10 and CX10A have used same protocol, I placed an order of CX10 from Banggood. It will take a time.. after receiving, I will report it here..
BTW If I want to send sample,should I send sample to who and where? Is there any developer to help this issue? I'm a protocol dev and I've the required hardware, you can send me a PM. 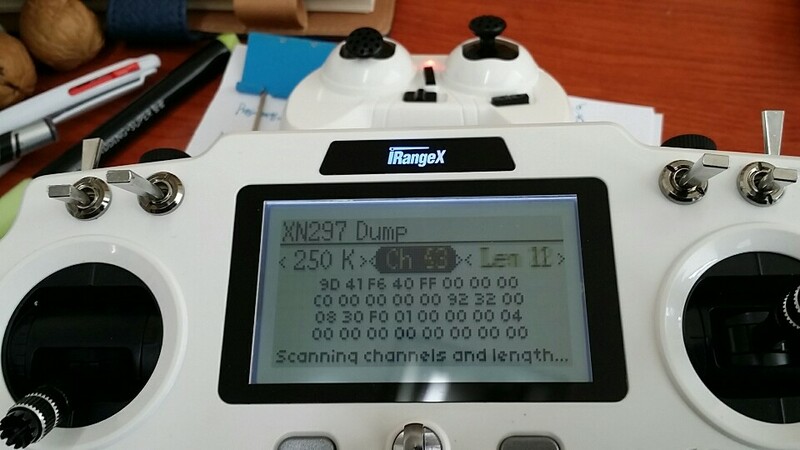 Note that I believe the TX is using a XNS1042 (and Cheerson has always used nrf24l01 compatible transceivers so far) but I can't be sure, so there's no guaranty. Last edit: 28 Feb 2019 02:13 by goebish. Anyway. let me check first if the recent CX10 and CX10a have same transmitter and receiver..
And then I would like to ask you if you don't mind.. If you PM me please post here as well because email notification doesn't work for PMs and I don't always check. Replied by Moeder on topic Cheerson CX10A has new another board. 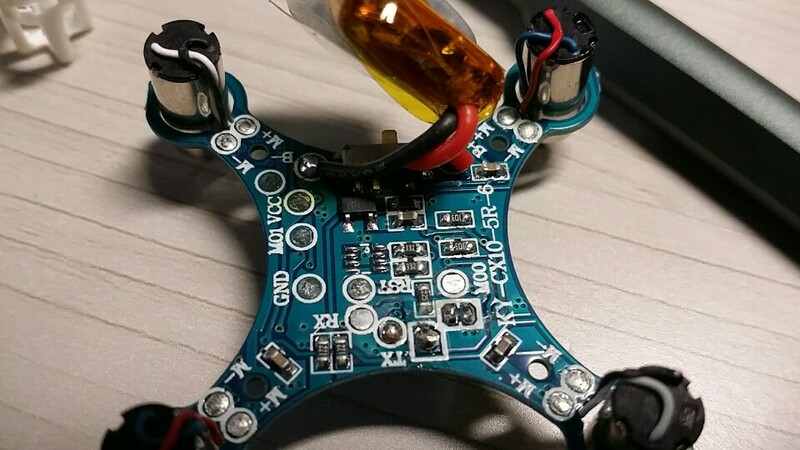 Do you still have the quad? If yes, could I give you a test build which will dump tx data for us? Yes. I still have it. due to the freight charge, I couldn't send it to PM. Anyway what I should do? please let me know. I will follow up and send it back to you. Thanks..
FYI, my transmitter is iRangeX iRX-IR8M. 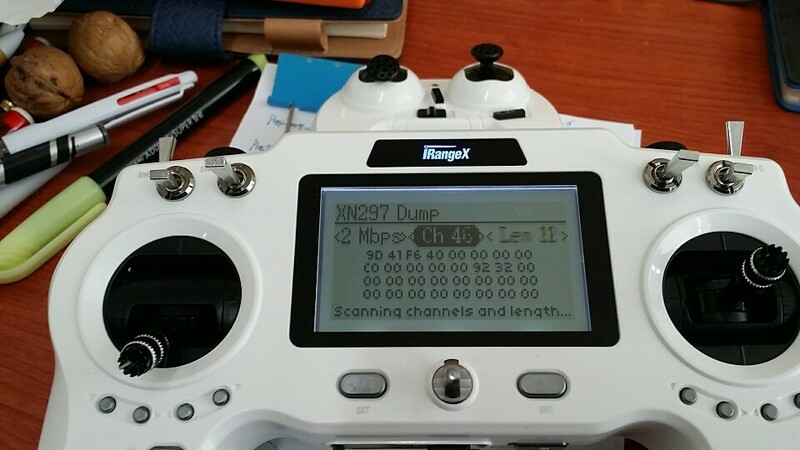 Here is a test build that includes the new XN297 Dump feature. First we'll check if this transmitter is using a XN297 compatible transceiver. 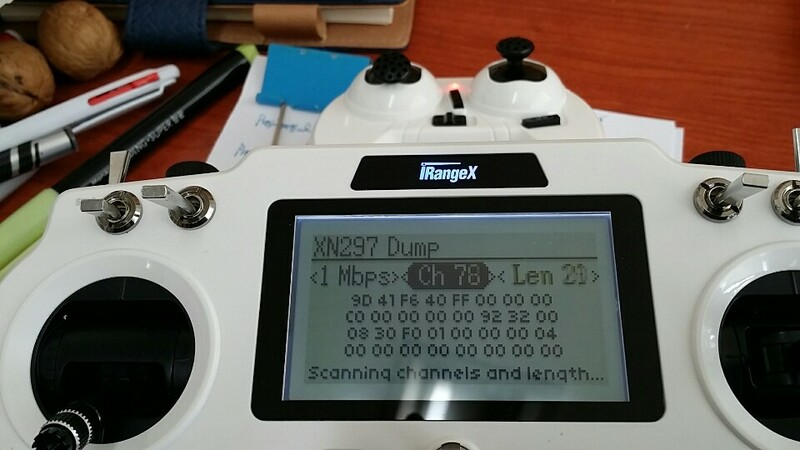 On your transmitter, go to model menu / model setup then select a blank model and set it to "XN297 Dump" protocol. Turn on scan by setting mode to 1 Mbps (Off -> 1 Mbps) then highlight < Ch 0 > and press ENT to start scanning. Turn on your CX10A transmitter. If valid packets are detected it should show "Valid CRC found!" on the bottom on the screen. If nothing is found, try 250 K mode instead of 1 Mbps. Last edit: 08 Apr 2019 10:06 by goebish. Thanks for making the build, goebish. I suggest not having the transmitters as close to each other as in the video, as this will likely give some false channels besides the correct ones (difference is usually a little flickering between valid and invalid packets on bleeding channels). Last edit: 08 Apr 2019 10:36 by Moeder. Got it.. I am going to flash it and test then report it to you soon. I am sorry for bad news. This firmware didn't detect any valid packet. it did continuous scaning.. Please take a look attached pictures. If there is anything that I can do, please let me know.. I will do with my pleasure. That might be a HS6200 but a SDR device is required to check that.